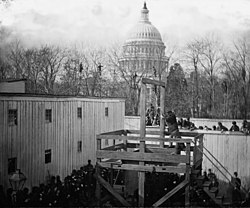 The execution o Henry Wirz in 1865 near the U.S. Capitol, moments efter the trap door wis sprung. Hangin is the suspension o a person bi a girn or ligatur aroond the neck. This page wis last eeditit on 5 Februar 2018, at 18:29.